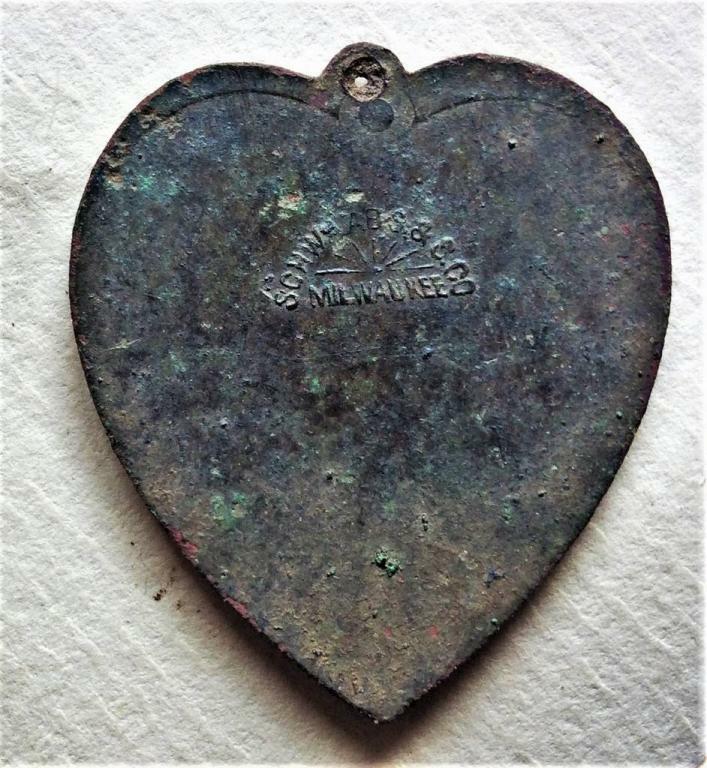 My cousin was digging in the older part of the garden and came cross this heart charm buried about a foot down. Looks like that was a souvenir from The Great White Fleet. Wonder what it was doing down there...? If they could talk Jim their travels or any of the milsurps stuff we collect then it should be a very interesting story I should say..... Nice find very early 1908. Your wearing me out !! I won't be much help on this one as we're getting my Mothers estate sale set up for last this week. But you know I'm a 'Just gotta know type"
First Leg... From Hampton Roads to San Francisco, 14,556 nautical miles. Departed 16 Dec 1907. 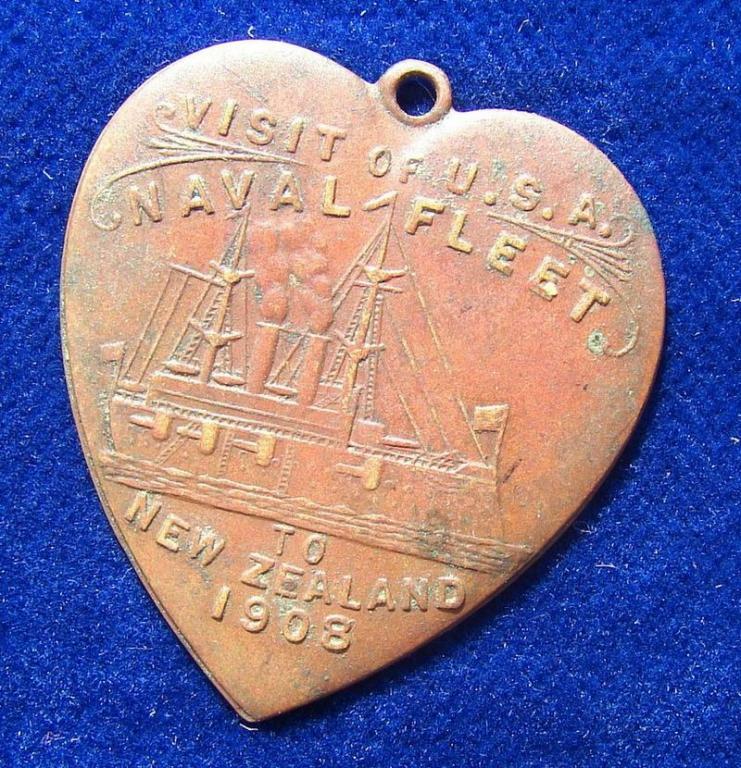 After heading for Trinidad, British West Indies, then on to Rio de Janeiro, Brazil; Punta Arenas, Chile; Callao, Peru ; Magdalena Bay, Mexico, and up the West Coast, they arrived at San Francisco, 6 May 1908. The Fleet, First Squadron and First Division, were commanded by Rear Admiral Robley D. Evans. First Division consisted of four ships of the 1906 Connecticut class: Connecticut, the fleet's flagship, Captain Hugo Osterhaus; Kansas, Captain Charles E. Vreeland; Vermont, Captain William P. Potter; and Louisiana, Captain Richard Wainwright. So......... Brand new ships !? 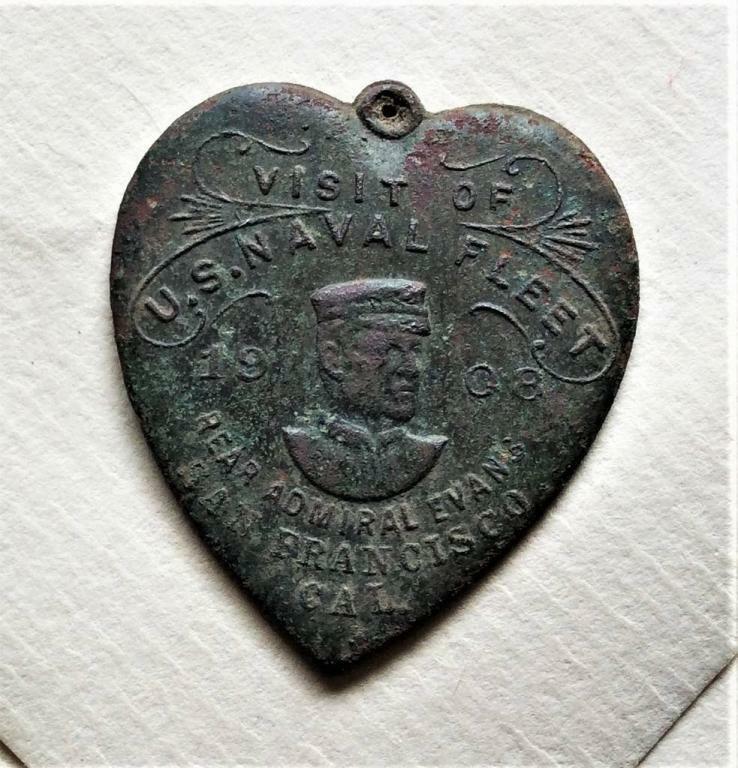 I'd guess the Heart shaped medallion was like a PR piece, maybe worn by the sweetheart of a sailor on board the fleet then lost in the garden. Rear Admiral Evans commanded the Great White Fleet 16 April 1907 from Hampton Roads, Virginia, in its passage from the Atlantic Ocean through the Straits of Magellan to the Pacific Ocean, where he was relieved of command in San Francisco, California, 9 May 1908, because of ill health. Admiral Evans retired from the Navy upon reaching the mandatory retirement age of 62 on 18 August 1908. He died in Washington, DC, on 3 January 1912. BTW, The Hotel Del Monte became the Postgraduate School of the United States Navy in the early 50's. My older cousin, in the Navy at the time, took a language class there in the 60's. I played their golf course once.